Ash Pollard – Dig Delve – An online magazine about gardens, landscape, growing & making. This year we have based ourselves here for three full weeks to see out the last of December and welcome in the new year. Your eye is free to travel further in this wintry landscape and it has been good to follow by venturing beyond our boundaries. Slowly – for it took a few days to get into the routine of it – a walk has started the day. We have been both up and down the valley and high onto the exposed ground of Freezing Hill to experience the roar of the wind in the beeches and to understand why it has its name, as it whips up the slopes that run down the other side to Bristol. Always looking back to see how we fit into the folds, we have contributed to our knowledge of muddy ways, well-worn tracks, breaks in hedges and crossing points back and forth across the ditches and streams. 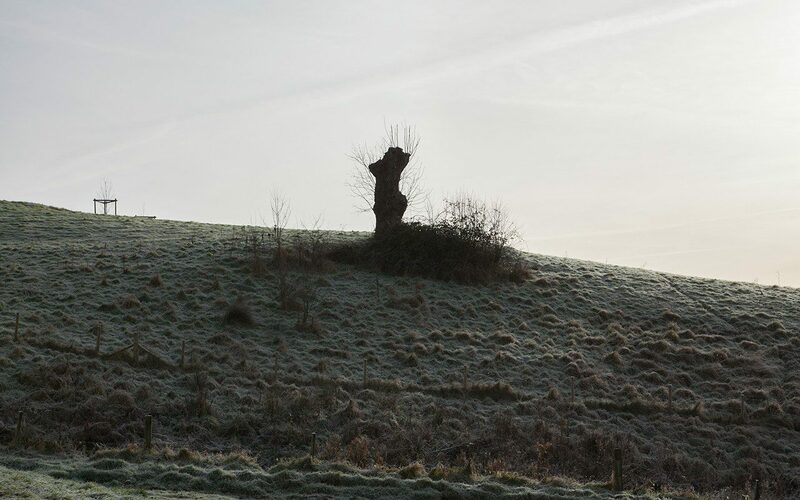 Marking our way – for nearly every field has at least one – are the ancient ash pollards. Ash wood burns green so the trees have value and owning enough pollards would keep you in firewood if you attended to them in rotation. The pollards regenerate easily from cuts made above the grazing line, so that they can grow away again unhindered by the cattle. Usually standing solitary on a steeply sloping pasture (where they add to their usefulness by providing summer shade for livestock) the pollards are stunted by decades of decapitation and, in combination, make an extraordinary trail of characters in the landscape. We have stopped at each one to take in their histories and their winter slumbers that expose their distinct personalities. Some are hollow to the core, the new limbs surviving on little more than a thin rim of bark. Inside the hollows map the decay and hold the damp and the smell of it even in the dry months. The halo of new growth that breaks from the old forms a crown of fresh limbs that in ten or twelve years are big enough for harvesting. To date the cycle has continued until the trees are exhausted and split and fail. Of course, we are waiting patiently to see if the pollards survive the chalara dieback that is moving across the country and is already in the valley. 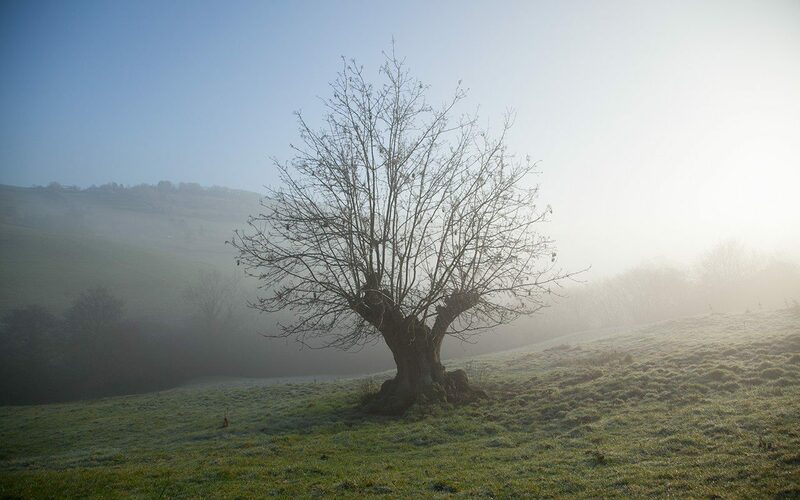 Neighbours who have lived here a lifetime recount how different the landscape was when the elms rose up in the hedgerows, but it is the ash and their potential demise that will now be cause for a new perspective. We have a solitary pollard on the west facing slopes of The Tump. The farmer who lived here before us climbed the tree to harvest the wood in the year he died. The tree must have been huge once, the trunk striking the form of an imposing female torso. An interesting presence given the fact that the ash was once seen as the feminine counterpart to the father tree, the oak. When we arrived here there was just a summer’s regrowth and I set to immediately planting thirty new ash in the hedgerows to provide us with our own rotation. So far – and I remain hopeful – they have done well, despite our mother tree showing a reluctance to throw out another set of limbs and the forecasts that estimate a five percent survival for ash in this country. We have let the grass grow long on the slopes that are too steep for haymaking around our pollard and in six years there are the beginnings of a new habitat. An elder has sprung from high in her crown and a black and sinister fungus from the side that has refused to regrow branches. Around her there is a skirt of bramble and young hawthorns where the birds have previously settled in her branches and stopped to poop. I plan to plant an oak I grew from an acorn amongst them. New life around the old and a suitable partner, I hope, for a changeable future.